Torture and secret prisons are “global phenomena” that are not being taken seriously by the Geneva-based United Nations Human Rights Council, warns a UN expert. 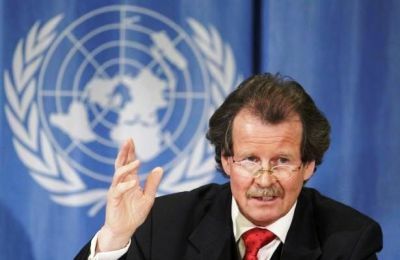 According to Austrian human rights lawyer Manfred Nowak, there is a growing gap between the high aspirations of human rights law and the sobering reality on the ground. The UN special reporter on torture was in Geneva this week for the council’s 13th regular session, which runs from March 1-26. On Monday Nowak, who has held his post for five years and steps down at the end of the year, presented a comprehensive global report on torture. He had already come in for criticism as one of the authors of a controversial joint UN report on secret detention, which looked at the global web of secret prisons, involving 66 countries, used in the fight against terrorism. That report was due to be presented this session, but last week the council postponed a debate until June as a compromise solution after opposition from African states and the Organization of the Islamic Conference. swissinfo.ch: What is your reaction to the postponement of your secret detention report? Manfred Nowak: I deeply regret that it has been postponed. It should have been taken seriously. It was a totally political consideration to tell us that we violated the code of conduct and acted outside our mandates. We are independent experts – the eyes and ears of the council - and we provided it with a report drawing their attention to a very serious worldwide problem based on a great deal of work over the past year. Secret detention is not just a minor human rights violation; it’s a crime, a major human rights violation. swissinfo.ch: How extensive is the use of torture as outlined in your five-year report? M.N. : Unfortunately torture is a global phenomenon. In all my missions there was only one state – Denmark – where I didn’t come across any serious allegations of torture. In all other countries there are isolated cases, like in Uruguay and Jamaica, more widespread, like in China, Mongolia and Indonesia, or systematic, like in Equatorial Guinea and in Nepal, a few years ago. It is much more widely practiced than usually recognized. The fact that torture is so widely practiced is surprising, but even more surprising for me was that in many countries the general conditions of detention in police lock-ups, pre-trial detention facilities, prisons, psychiatric hospitals and special detention facilities for illegal immigrants’ amount to cruel and degrading treatment. swissinfo.ch: What are the main reasons for this widespread practice? M.N. : The general administration of criminal justice in many countries is not functioning properly. It is not funded enough, judges are not independent and politicians want to be tough on crime, so a lot of pressure is put on police to solve cases. Of course the fight against terror is another reason, but in quantitative terms most torture victims are ordinary criminal suspects. But the fight against organized crime, terrorism and the global fight against terror since 9/11 have done quite a lot to undermine the ban on torture. swissinfo.ch: Last week Swiss Foreign Minister Micheline Calmy-Rey defended the work of UN human rights experts saying they were ignored and increasingly victims of “virulent attacks” by states. What’s your view? M.N. : I am seriously concerned by the way states at the Human Rights Council are treating their own independent experts. The council should stop criticizing its own experts and start taking human rights seriously and collaborating with its independent experts to address major human rights violations by the states that are responsible. On sensitive issues the easy way out is to accuse us of violating the code of conduct. swissinfo.ch: A review of the council’s working methods is due to take place in 2011. What changes would you like to see? M.N. : Today the situation at the council is worse than before the UN Human Rights Commission, with a north-south conflict that is highly politicized. We need to break this cycle of bloc voting. We have to overcome these political tensions and address human rights issues across the different regions, finding governments in all parts of the world that are committed to human rights and not with political agendas. The council’s Universal Periodic Review process [of states’ human rights situations] is in principle non-selective and a positive development. But many of the discussions are highly politicized. States should not assess the human rights performance of other states, that is a function for independent experts. Also, there is an increasing tendency of putting pressure on NGOS at the council. There is a growing gap between a very high level of legally binding obligations for states and the reality on the ground. We have to overcome this through prevention and stronger mechanisms to monitor states’ implementation of human rights. There are major proposals, such as a World Human Rights Court, or a global fund to strengthen national human rights implementation mechanisms, but what is lacking at the moment is political will to take human rights seriously. Manfred Nowak, born on June 26, 1950, is an Austrian human rights lawyer. He is a professor of constitutional law and human rights at Vienna University. He also is scientific director of the Ludwig Boltzmann Institute for Human Rights. Nowak was one of the judges of the Human Rights Chamber for Bosnia and Herzegovina between March 1996 and December 2003. He has been the UN special reporter on torture since 2004. The United States is among dozens of countries that have kidnapped and held terrorism suspects in secret detention over the past nine years, violating their basic human rights, the report charged. Algeria, China, Egypt, India, Iran, Russia, Sudan and Zimbabwe are also detaining security suspects or opposition members in unknown places, it said. "On a global scale, secret detention in connection with counter-terrorist policies remains a serious problem," four independent UN rights investigators said in the year-long study based on research and interviews with 30 former detainees. Victims and their families deserve compensation and those responsible should be prosecuted, they said in the 226-page report. "Secret detention as such may constitute torture or ill-treatment for the direct victims as well as their families," the report said. The very purpose of secret detention was to facilitate and cover up torture and inhuman and degrading treatment to obtain information or silence people, it said. Heute waren schon 5 visitors (79 hits) hier!